It is well-known that fire regimes are strongly linked to climate, however, there are examples in which most variability in fire regime changes are better attributed to drivers other than climate. For instance, vegetation (fuel structure and continuity) also plays a role in shaping fire regimes [1-5]. In a recent paper , we reviewed evidences from different environmental and temporal settings of abupt fire regimes changes that are not directly attributed to climatic changes, but to changes driven by (i) fauna, (ii) invasive plant species, and (iii) socio-economic and policy changes. All these drivers might generate nonlinear effects of landscape changes in fuel structure; that is, they generate fuel changes that can cross thresholds of landscape continuity and thus drastically change fire activity (figure below). The importance of climate-independent factors in abrupt fire regime changes can be viewed positively: while climate is very difficult to modify at short term, fuels can potentially be managed to shape fire regimes and to mitigate the effects of global warming . However the success of these actions may be diverse, depending on the historical fire regimes and the adaptive traits of the species in the community . Figure: Schematic representation of how a gradual change in a driver (e.g., a constant colonization or invasion of a flammable plant) can produce an abrupt change in landscape structure (e.g., continuity of the flammable vegetation). 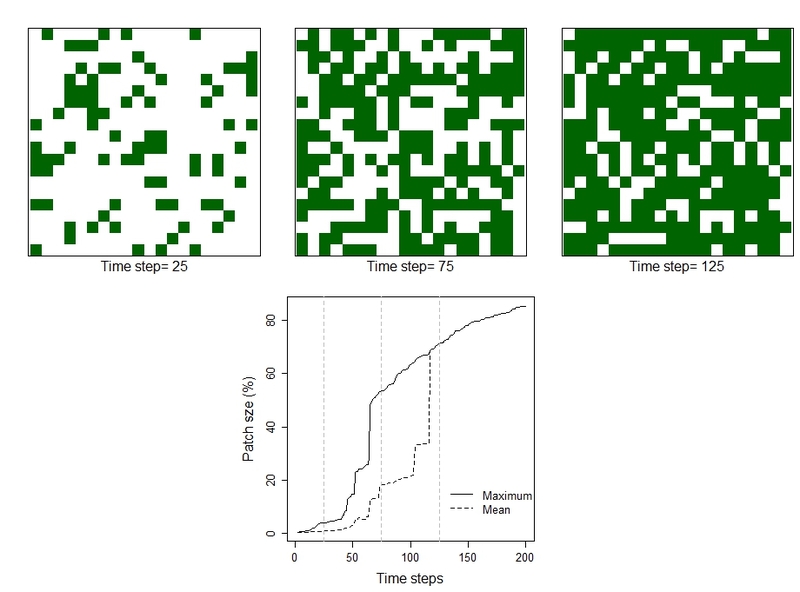 The bottom panel represents the changes through time in mean and maximum patch size in an idealized landscape that is invaded by plants (green cells) with a constant probability (p= 0.01 in each time step). The upper panel shows three snapshots of these dynamics (time steps = 25, 75 and 125, also represented by vertical lines in the bottom panel). From Pausas & Keeley . Pausas J.G. & Keeley J.E., 2014. Abrupt climate-independent fire regime changes. Ecosystems 17: 1109.1120 [doi | pdf] – New! Towards prescribed fires, jgpausas.blogs.uv.es, 7 Oct 2013.